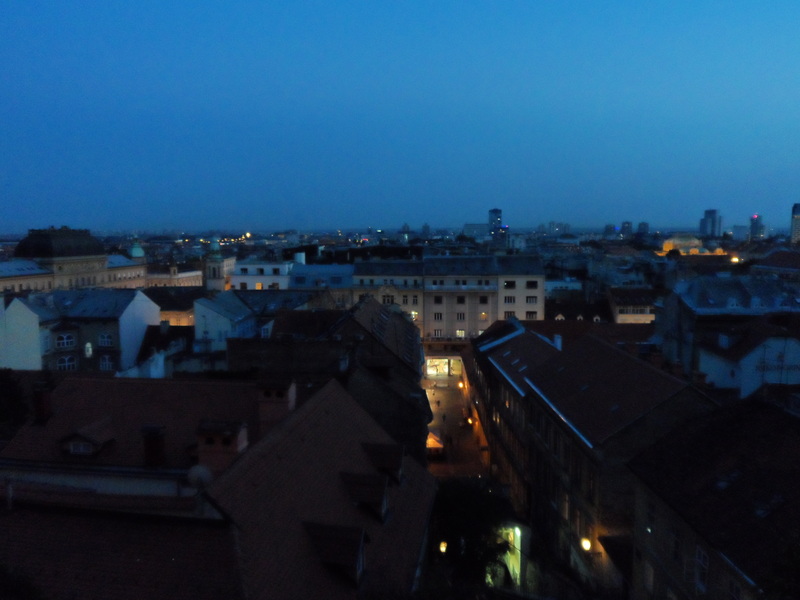 During my last night in Zagreb I was walking around the city after visiting the museum of broken relationships. This museum by the way, is very funny and I can recommend it for anyone who likes a modern museum with a modern theme. 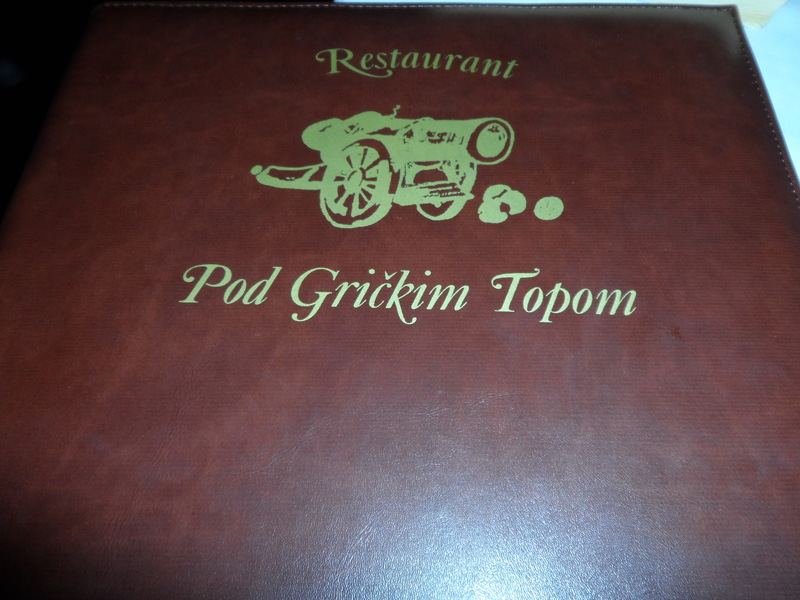 Just walking down the hill the first restaurant I bumped into was this Pod Grickim Topom (http://www.restoran-pod-grickim-topom.hr/) luckily I don’t need to pronounce it because I really don’t have a clue… After seeing the front door from a distance I almost turned around because it looked like just the next traditional Croatian grill restaurant, only when I came closer I noticed the very good looking menu. And since I was looking for some different food it appealed to me right away! On the inside it had a perfect view over a part of the city and on the background they were playing Sinatra, so I felt comfortable right away. I very nice man showed me a table and brought the menu right away. He had some great suggestions as a starting drink and came back quickly with some local 7 herbs throat burning drink, luckily with a bottle of water on the side as well. Reading the menu I quickly knew what I wanted as a starter, the steak tartare, a classic! There was a big choice of high quality starters so it wasn’t that easy maybe I just had a craving for a good steak tartare. Unfortunately the quality wasn’t that good, and at a price of around €11 you expect more, for Croatian standard, that’s a lot of money! Ok, maybe it was pretty dumb to order this dish at 38 degrees but when I order a steak tartare, I expect it to be cut by hand and not put into the blender…. which made it look like minced meat. The taste was good it just was the structure and the temperature that destroyed it, so I was regretting not to have chosen some of the dishes I saw on other plates. Good thing was the local rose wine, WOW what a bomb. I asked for the house wine and this was the suggestion wine which luckily was available by the glass. 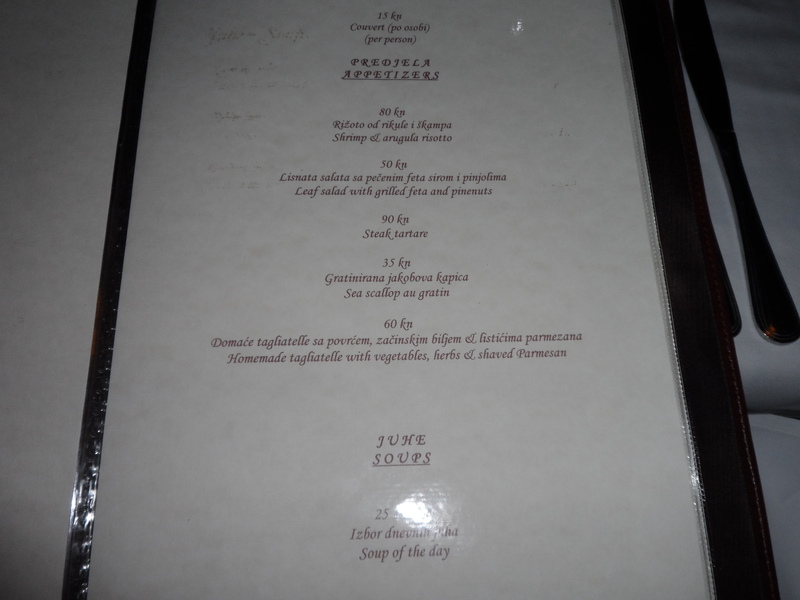 Since the bottle was not on the table I cannot repeat it’s name, it sounded like hrvatsikalerekerskert rose wine…. When I find out what it is I will put it on here. 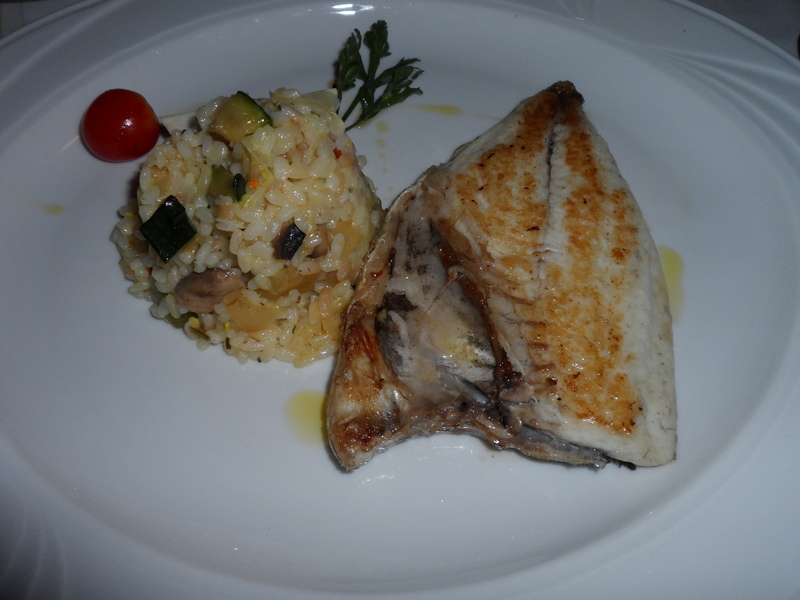 I ended up, after being indecisive for 20 minutes, with the Bream Filet with Mediterranean risotto. Accompanied by the same rose wine it was delightful, it made up the mistake of the previous dish. Good quality of frsh fish, nice rich and buttery taste coming of the bone perfect and the way fresh Bream should taste. Then the risotto, a bit dry, but the again everybody makes it in a different way, I don’t believe in “the perfect risotto” every cook has got his own recipe and a lot comes down to personal opinion. Besides the structure, the taste was absolutely fabulous! Great taste of rich olive oil, red peppers, red onions, zucchini, tomatoes and Parmesan cheese, good good good ! Playing Elvis Costello now in the background, great, great, great ! Then it was time for dessert, but trying to stay as slim and athletically build as i am right now (people knowing me are laughing right now…), I had to refuse. 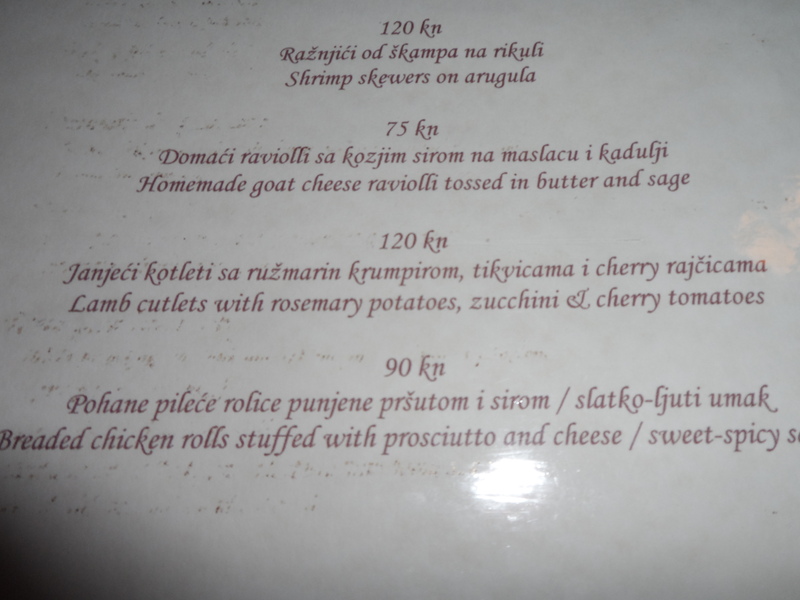 I had a bit to much of the lovely bread and cream cheese in the beginning and now I was paying the price… So it was time to literally pay the price… You pay a lot above the Croatian and Zagreb standard and with a bill of €45 it was even high for this part of Europe. Just for a starter, main dish, 2 glasses of wine (3 on the bill because as he said, he poured in a double portion on the second glass…???) and a bottle of water. 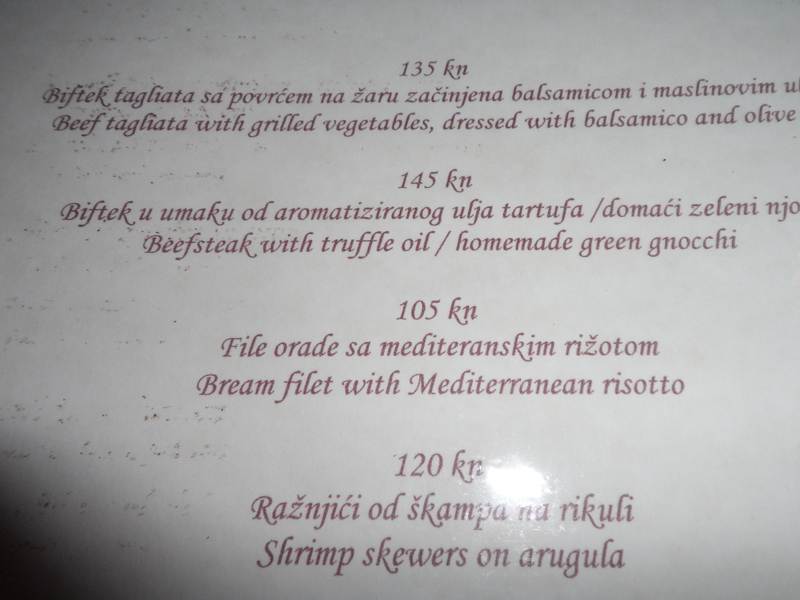 Decide for yourself, I think it is one of the best restaurants around Zagreb but you will have to pay and not everything is perfect. But for the music, rose wine, view and nice staff for me it was definitely worth it.